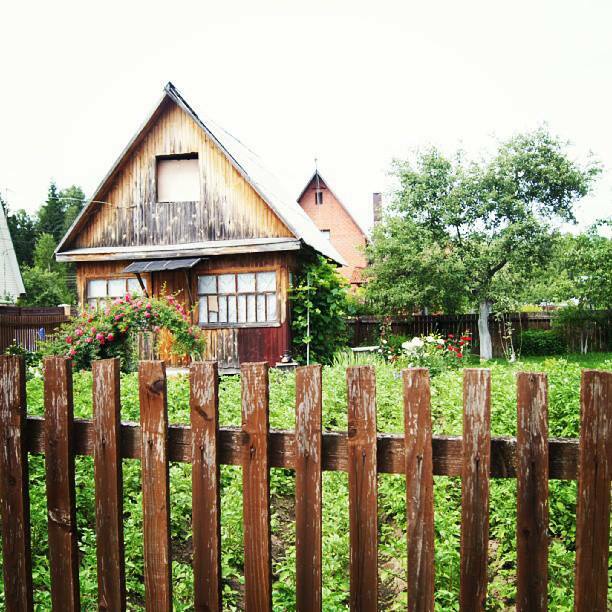 Two weeks before I moved to Moscow last August, I read a National Geographic article about dachas, Russian summer homes. Gardener that I am, I knew that living in an enormous city for a year would be difficult, especially a city in a country with such a long, dark winter. So, I vowed to get to a dacha. 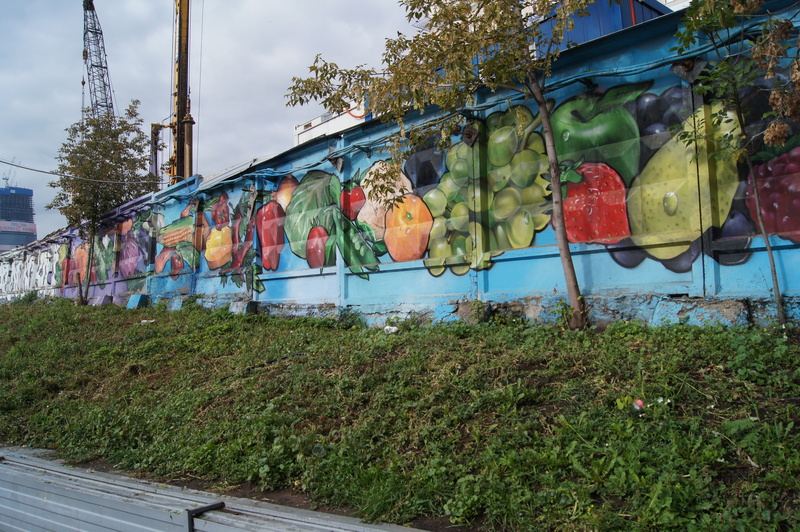 Later, some of my American friends who study Russian said “If you get the chance to visit a dacha, go.” They described never-ending food and vodka; long, sunny days; gardens; and a break from Moscow stuffiness. The culture surrounding dachas fascinates me. They’ve apparently been around since Peter the Great, but they became more common in during the Soviet Period, when the government gave land to citizens. This land had strict regulations attached to it–since it was to be used for gardening, the new landowners couldn’t built anything bigger than a shed for tools and maybe a small area to sleep overnight. Now those restrictions have been dropped, and people can buy their own land and build whatever they like (within village regulations, I assume). 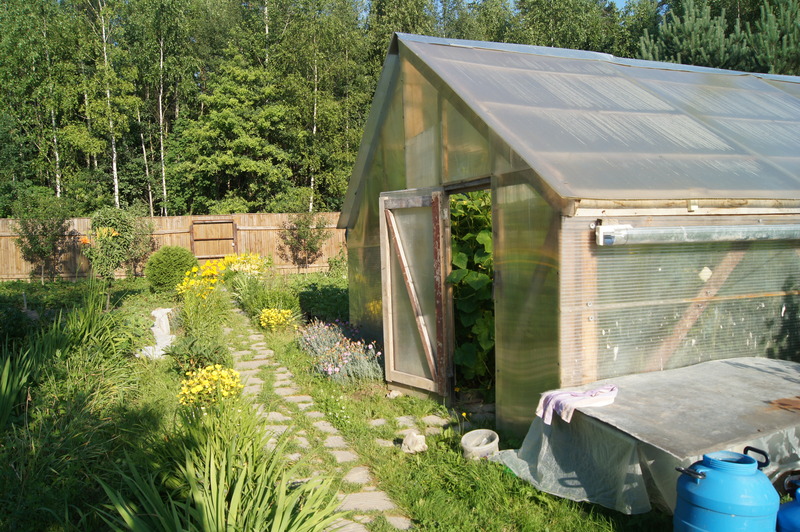 Depending on the village and the owner, some dachas are mansions and some still look like gardening shacks. As the NG article points out, the purpose of the dacha is now contested–for many members of older generations it’s a place to work; for some, it’s a place for the family to be together; for the younger generation, it’s a place to relax; and for the elite, it’s another way to exhibit wealth; for others, it’s a mixture. I have no research to back this up, but I’d guess that well over half of Moscow’s families own dachas; obviously, from the middle and upper classes. On Friday evenings and Saturday mornings, the traffic leaving the city is ridiculous and makes the normal 45 min to 2.5 hour drive to the dacha last anywhere from 3 to 6 hours; the same thing happens on Sunday evenings when people return. 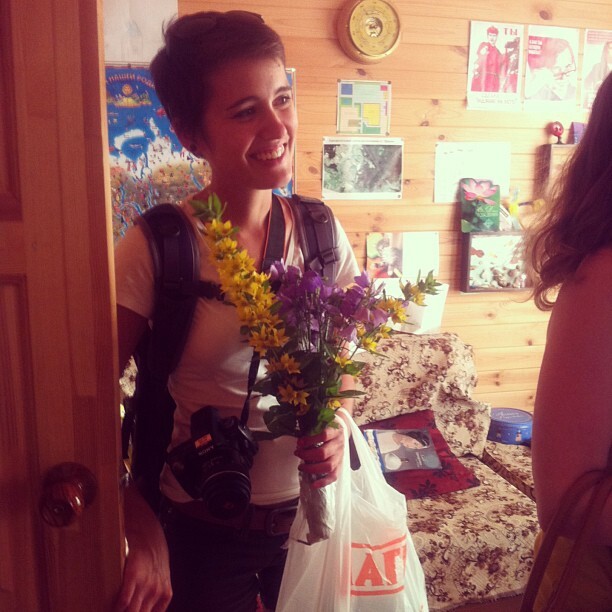 For many Muscovites, going to the dacha isn’t something to do a few times a summer, but every weekend; my Moscow best friend, Sveta, gets legitimately upset if she doesn’t make it to the dacha each weekend, and after visiting one, I understand why. Some people go there for the entire summer, like my friend Anya who took her 3-month old daughter to the dacha in May and is still there. I’ve never seen anything like dacha culture. Sure, Americans make a mass exodus for certain summer holidays and many people own lake houses, but it is nothing like this. It makes sense, though, right? If you get 3 months of enjoyable/warm weather, you won’t waste them. This is why Musocvites line park benches every night after work, why old men sunbathe in Speedos at 7 am, why people stand in the most awkward positions just to be in the sun and not the shade made by trees in the forest, as if they can get all the Vitamin D their bodies need in a 3 months. Maybe they can. 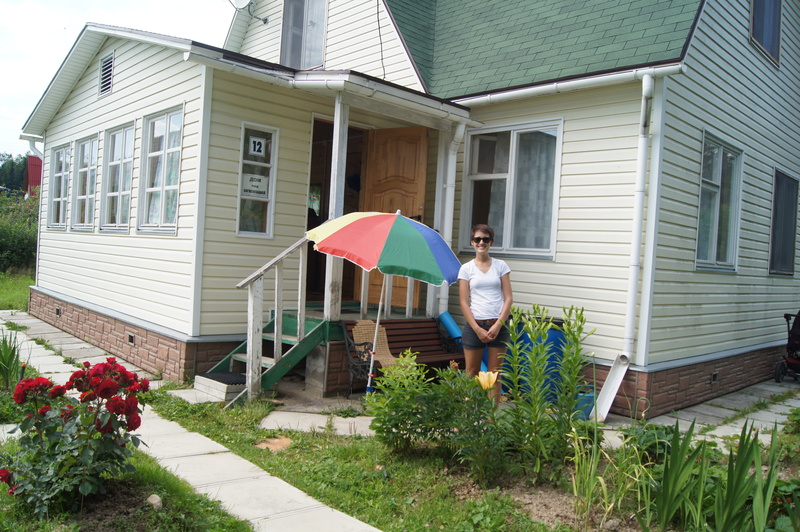 At the end of June, I finally made it to a dacha, that of my friends Anya and Nastya’s family. 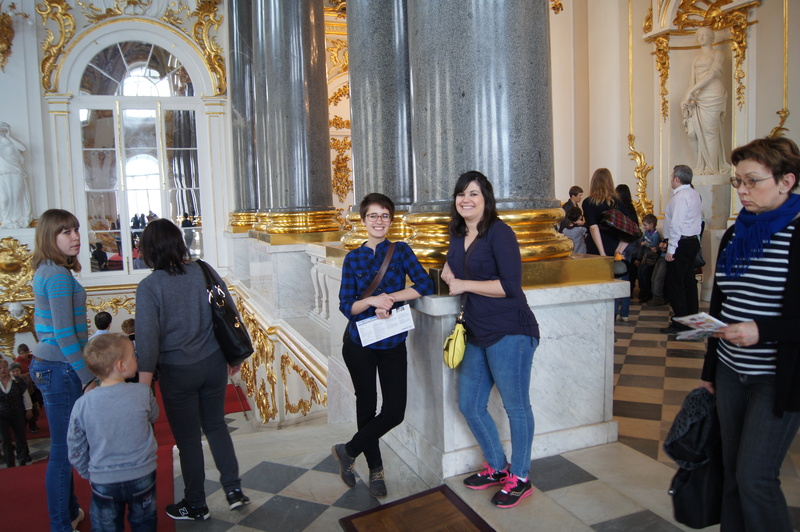 Unfortunately, Nastya and I couldn’t devote the entire weekend, so we left at 8 am on Saturday morning. The 1.5 hour drive only took 3 hours, so Nastya said that the traffic wasn’t too bad. My first surprise was that dachas are all different, not a series of wooden houses with flowers as I’d expected. Some were wooden, but some had siding and a few were even brick. As I mentioned earlier, Anya is there this summer with her daughter Masha, her parents, and their aunt; Anya’s husband Dima commutes from Moscow every weekend by train. I’d hardly been introduced to the family before Anya asked if we wanted to pick strawberries, which we had with творог for a late breakfast. Though they didn’t speak much English, Anya and Nastya’s parents were incredibly kind and hospitable to me and we talked through Anya and Nastya’s translations. They sold their old dacha and built this one about seven years ago. 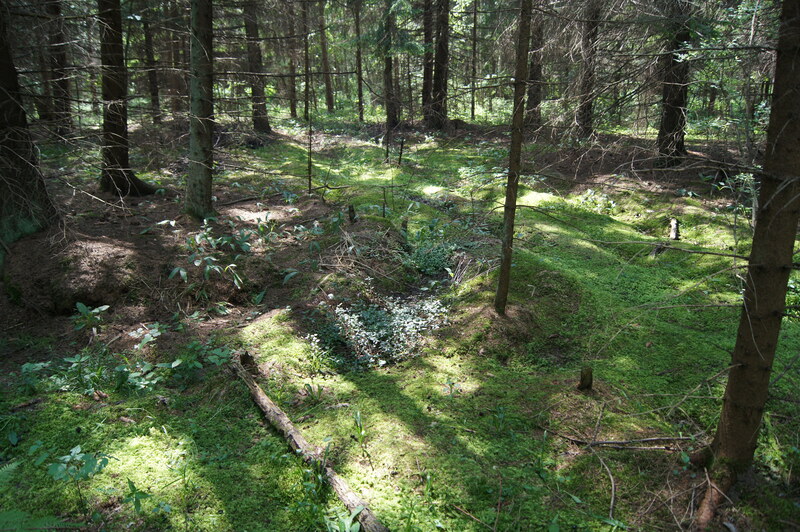 I learned two things in the Russian forest: First, Russia has a lot of mosquitoes. Though the hat made me look funny, I was thankful to have it. I must have reapplied bug spray 5 times and still had bites the next day. Second, berry picking is serious business. Nastya and Anya’s mom Olga was quick and thorough. 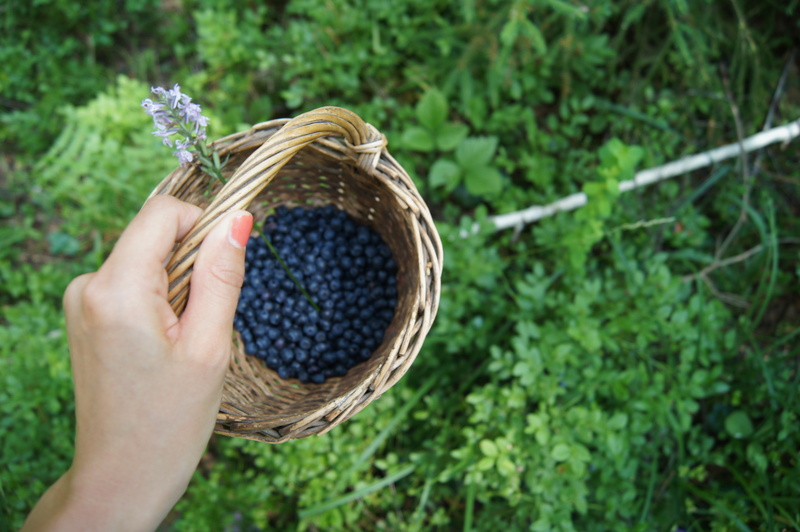 We were looking for these berries that are essentially mini blueberries (we later used the dacha’s WiFi…yep, Dacha WiFi (and though I brought it along, I refused to used my tablet)…to learn that they’re actually called “bilberries”) and though we passed bushes of them, she trudged on through tall grass and fallen trees until finally, we found an area that she deemed mostly untouched. 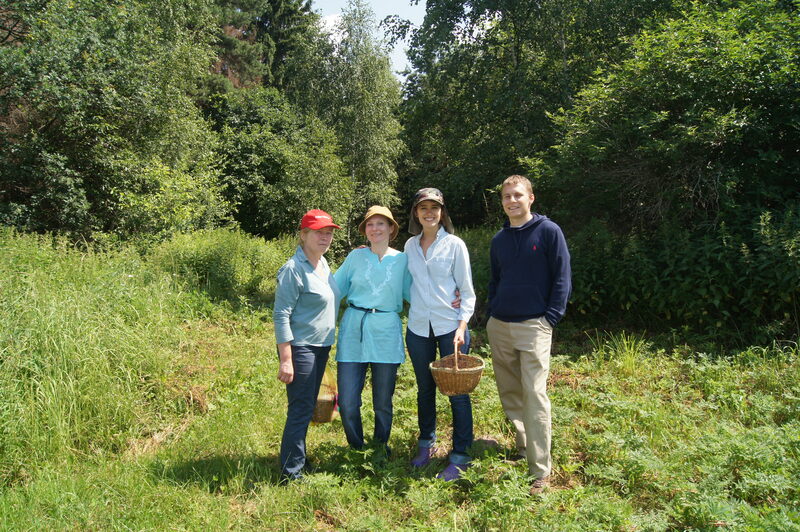 When we finished, Olga had picked three times as many berries as anyone else. We also stopped for mushrooms, mini-strawberries, and wildflowers. After lunch, we went to visit one of their neighbors. 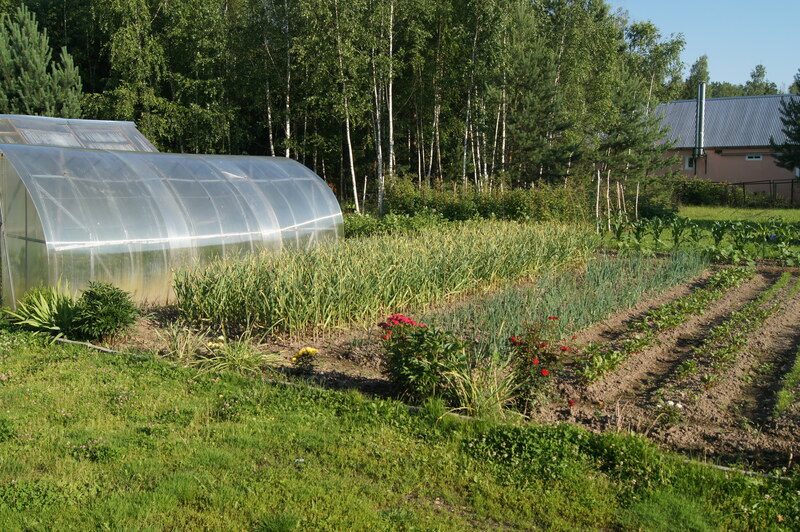 Her land is actually a few plots put together and she’s filled it with an enormous garden: onions, beets, corn, cabbage, sunflowers, potatoes, strawberries, raspberries, flowers, and two greenhouses with tomatoes, peppers and cucumbers. We talked about her methods and the full work days she puts into the garden. She sent me off with strawberries, peppers, and cucumbers. The rest of the day was spent talking and resting and playing with Masha. After a walk and some cake with tea, it was time to leave. I felt tired, the same wonderful, fulfilling tired I felt as an 8-year-old at the end of an evening spent in the backyard collecting lightening bugs. They sent me away with wildflowers, bilberries, and strawberries. As we left, Anya’s father said “Well, your dachas in America must be better,” and I replied “No, we don’t have them.” I considered adding that we should have them, but honestly, I don’t think this would work as perfectly anywhere else. Lawrence buds Ben + Sarah visited me in Moscow and we went to St. Petersburg. 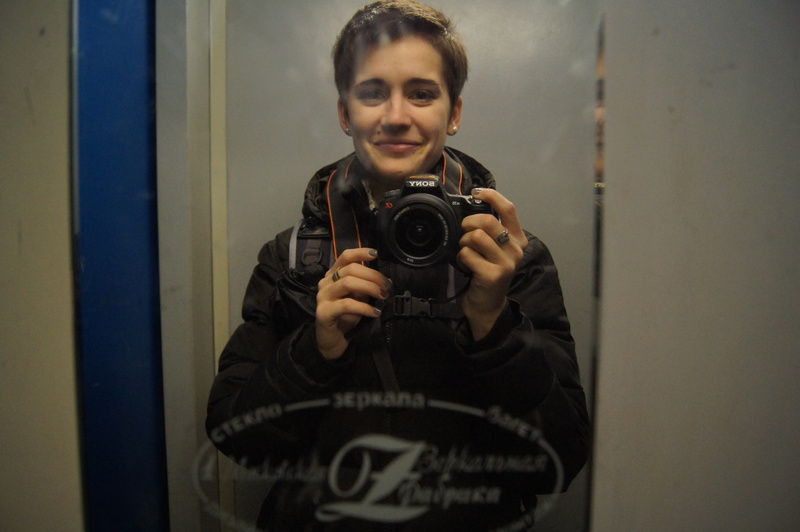 I have almost as much to say about the night train to St. Petersburg as I have to say about St. Petersburg itself. Basically, it fascinated me. The rooms are super tiny and they have two sets of bunk beds. We are Americans, so our luggage was kind of big. After some struggle, Ben was able to get our suitcases put out of the way. Sarah and I attempted to be helpful, but the room was really too small for us to do much. Since there were only three of us (and the rooms hold four), we had a Russian roommate, Pavel. After we got our luggage crammed into the storage spaces under the seats and wedged under the table, Ben, Sarah, Pavel, and I all sat on the bottom bunks and looked at each other. He worked for a “military company” and traveled to Moscow often. He was nice enough and quiet. He answered our train questions. When we tired of looking at each other, we decided to go to bed. This didn’t take long because the train left at 11:59 pm and we were tired. The night train gives you a toothbrush and toothpaste so to keep from having to dig through my luggage, I used it; its plastic bristles came out in my teeth and that was weird. I had dibs on the top bunk, and Pavel had the other top bunk. Before we turned off the light, he undressed modestly under the covers. That was also kind of weird. Ben said he couldn’t relax and sleep with a stranger in the room, but it didn’t bother me, even though that stranger was in his underwear. The train bed was more comfortable than my couch bed and the rocking motion helped me fall asleep. I heeded Pavel’s warning and went to brush my teeth with the train toothbrush and change clothes. The morning after was quite possibly the most interesting part of the trip, and waiting in the long line for the bathroom gave me time to observe the other passengers. Some of them were already back in their suits/business clothes and some of them were still in their pajamas or shirtless and almost everyone had bedhead. People wore cheap plastic flip flops or house shoes as they stomped through the hallway. Seeing adult strangers in their pajamas immediately after waking feels incredibly intimate. The train stewardess was still working and she could carry four mugs of hot tea in one hand. 1. Beautiful architecture. Canals. 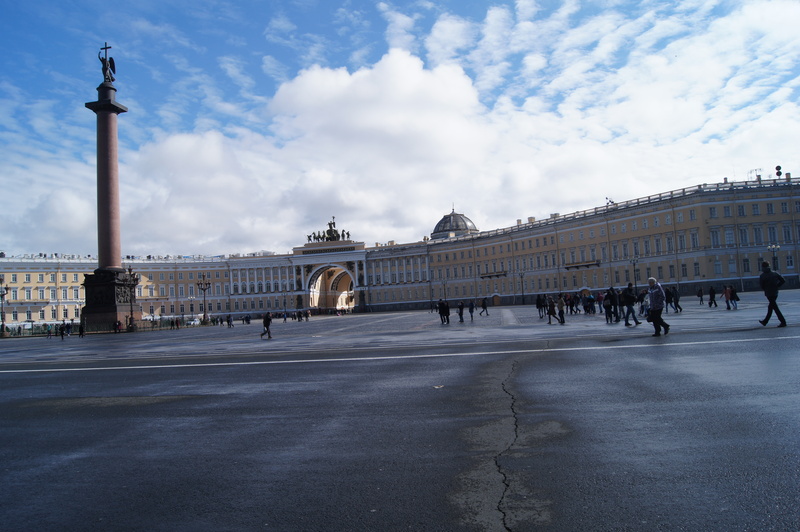 Big, open squares. 2. Cake/pastries and beer, though never together. 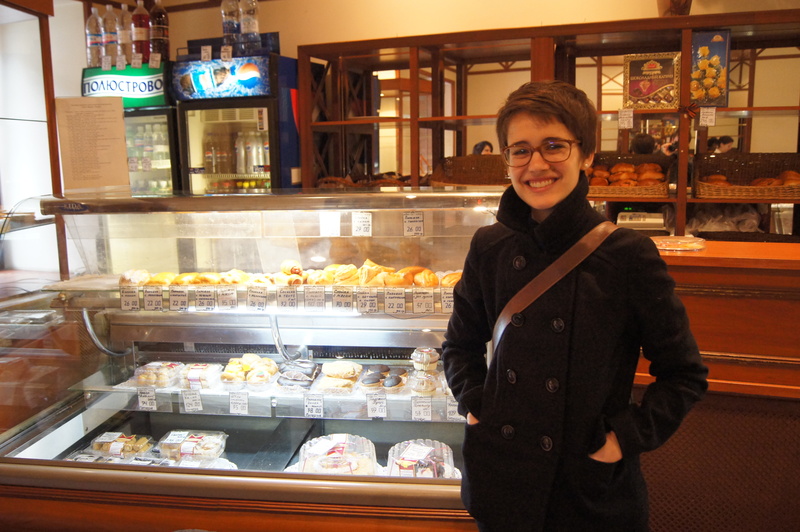 We found our own hole in the wall bakery where we had delicious cheese pastries multiple times. 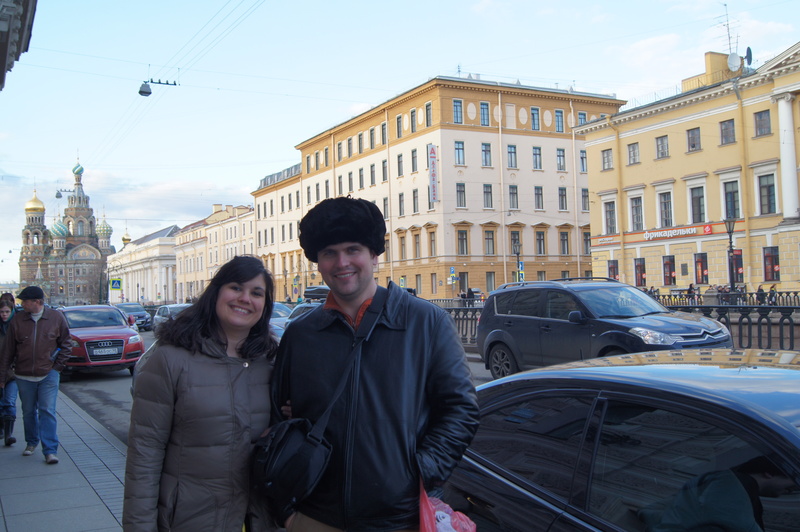 We also went to this famous Soviet-style bakery named север. The cakes were delicious but the ladies who sold the cakes there were grouchy. I’ve gotten a thicker skin about stuff like that and didn’t shed one single tear, just ate my cake. 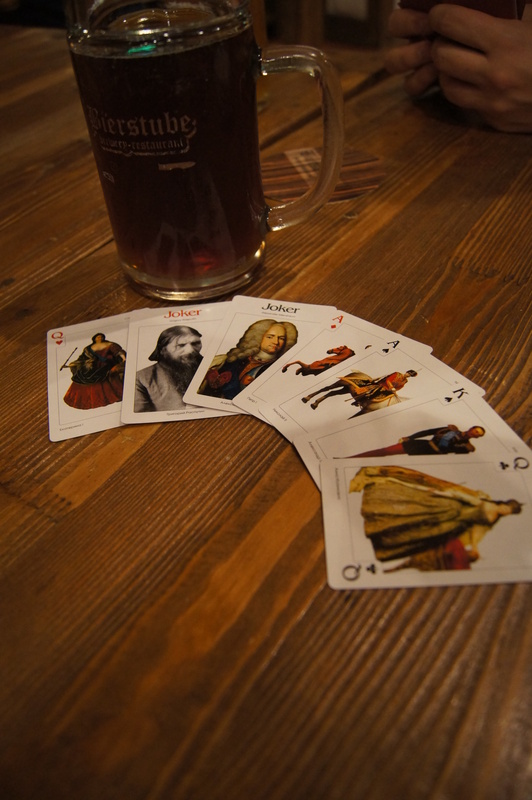 I had my first beer brewed in a Russian microbrewery. In fact, we found two bars that brewed their own beer. This was great, because I was starting to think that “Siberian Crown” and “Zatecky Gus” were the only Russian beers I was going to have. Ben + Sarah also bought playing cards with the Russian oligarchs’ portraits. 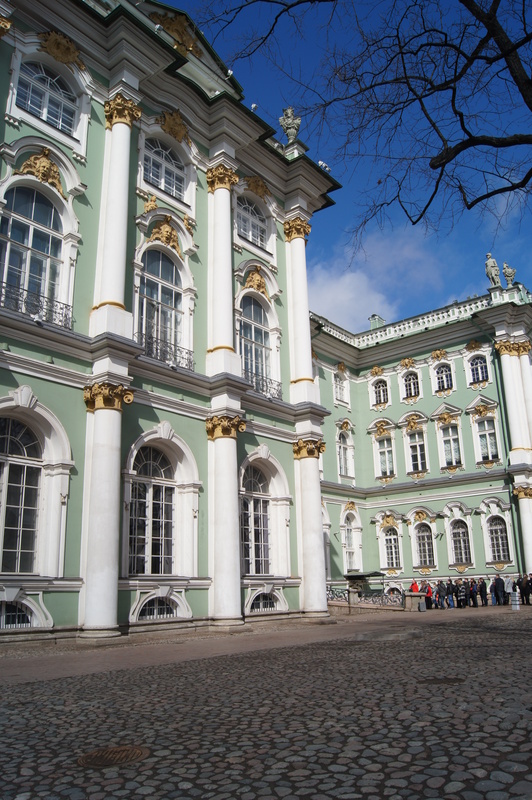 The Hermitage used to be a palace and now it is a museum and it houses tons of Russian art, European art, and “Russian lifestyle” exhibits, and also there are mummies in the basement. Though the art and mummies are cool, the coolest part is that they’ve kept many of the rooms as “Palace” rooms. So, you get to stroll into a ballroom or stand in the throne room. 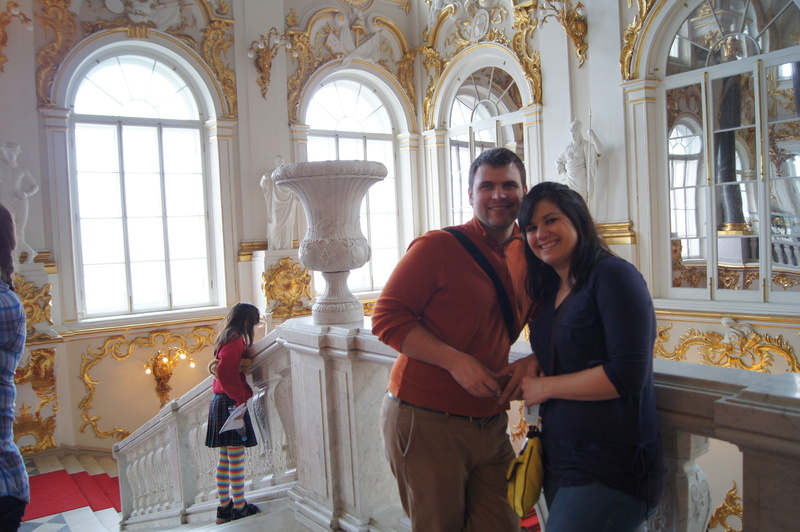 I don’t typically choose ornate decor and/or gold, but the Hermitage wore it well. As we left the Hermitage, a bike race was ending. 4. I finally went to a Russian ballet. We saw Swan Lake. I was going to try to sneak a photo, but when the lady caught us eating really tiny chocolate bars and said “We don’t eat in here,” I lost my courage. 5. Souvenir shopping. 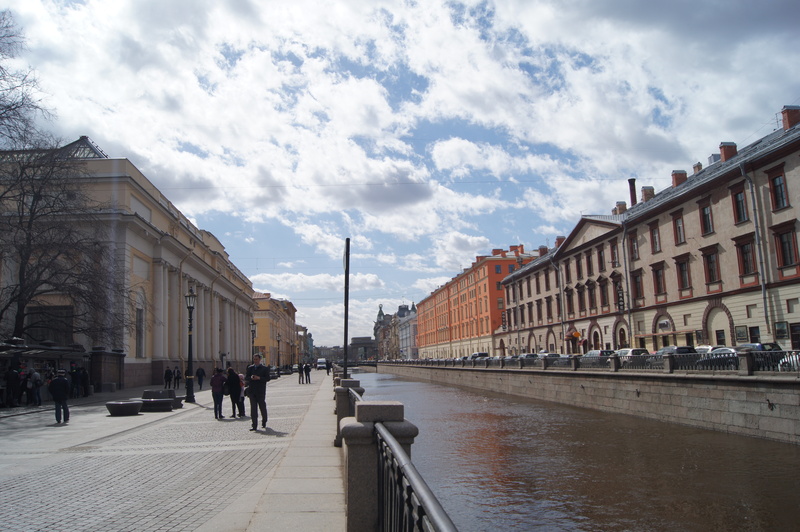 Like Moscow, St. Petersburg had areas filled with street vendors. 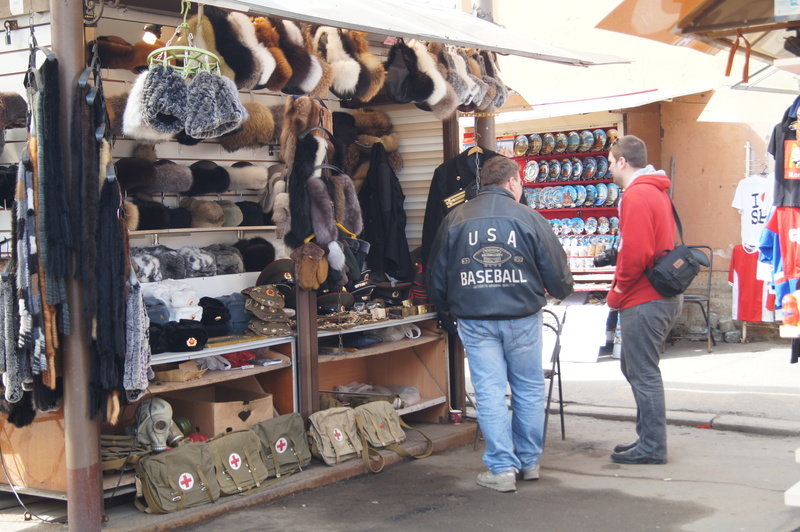 While looking for a hat, Ben became friends with this Russian man wearing a USA Baseball leather jacket. When we went back the next day, the USA Baseball guy wasn’t there, but Ben did find a hat. Luckily, Sarah and I were able to talk him out of the one that looked like it was made of gray rabbit’s fur. It was real big. Because Ben + Sarah had to catch their flight the next day, we took the bullet train back. It was faster, but there were no bunk beds. I worked until 7:30 pm on Thursday, November 22nd, known in the United States as Thanksgiving. Actually, it was one of the most stressful days I’ve had at work thus far. Between jetting into the center of the city for a meeting for which we were late; trying to explain that it would be extremely difficult to cover the entire discipline of Rhetoric and Composition (which as I’ve explained doesn’t really exist yet in Russia) and Writing Across the Curriculum and how to write a research paper in a four-day conference; and rushing back to my school for an appointment with a student (for which I was also late), the day felt a little hectic. Amidst all my running around, though, I did see a real, stuffed turkey in a store window. And that seemed very Thanksgiving-y. Actually, missing Thanksgiving didn’t feel like that big of a deal. After all, my younger sister Alyssa did it last year in London. And if your younger sister can do something and make it seem easy, as the older sister, you’re sort of obligated to just grow up and do it. I definitely missed seeing my family and I really missed Grandma Wiseman’s rolls and Grandma Pat’s homemade pumpkin pie. But, I assume that if I ask (both on the blog and in person) and if I smile real nicely, I can have those things when I visit for Christmas. Maybe knowing I get to do Christmas makes it easier, too. Luckily, my workday eventually ended and I got to go to an expat Thanksgiving potluck. 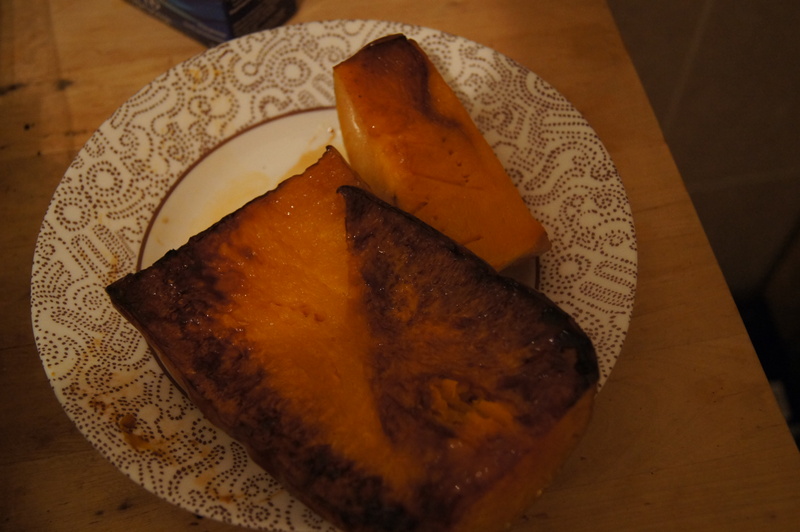 The night before, I roasted part of a butternut squash while video chatting with my family. I had to roast it in chunks because both my oven and the one pan I own are both small. 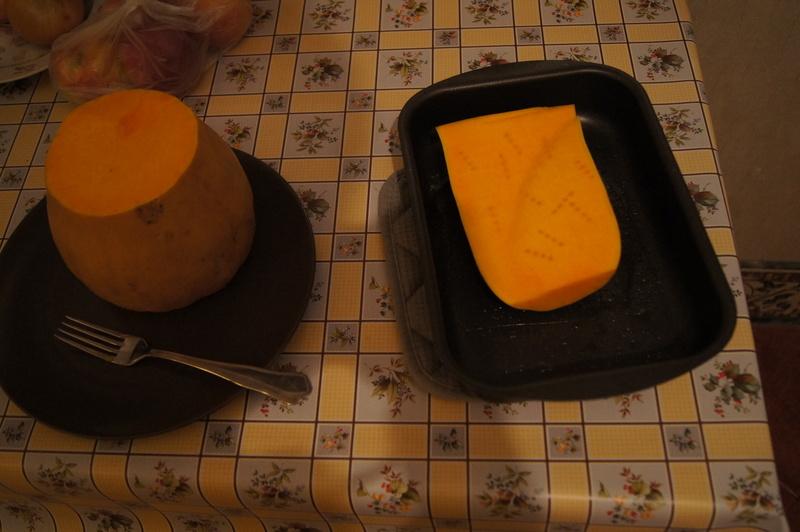 And the butternut squash was huge. No matter; I roasted the other half over the weekend and used it in soup and my apartment smelled like fall for days and I was happy. 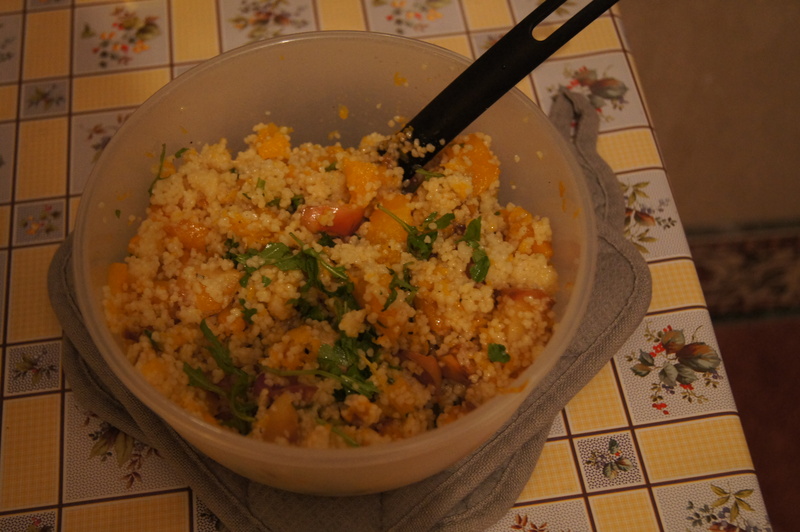 With bestie Molly’s help, I decided to make couscous with roasted butternut squash and roasted apples for the potluck. Expat Thanksgiving potluck was great. We had most of the things you’d expect to have plus some other things–spinach salad, bread + cheese + deli meat, dressing, MASHED POTATOES, rice + mushrooms, pumpkin pie, apple cobbler and chicken (since a whole turkey was not to be found). It should be noted that I can say almost all of those foods in Russian. We accumulated enough alcohol that everyone could have their own bottle of wine. We were young PhD students and young photographers and young journalists and some of us were even young Russians having their very first Thanksgiving. And in the crowded flat with palm tree wallpaper, we talked about our jobs/projects and our families in the States and our lives in Moscow. I barely made the last metro home. And there was no Black Friday; we just went to work. No one was trampled at WalMart in the midnight rush to get one of three $15 GPS systems for their car. Here in Russia, we just push each other into overcrowded metro cars and run out of things at the grocery store like milk. But no one ever gets trampled. 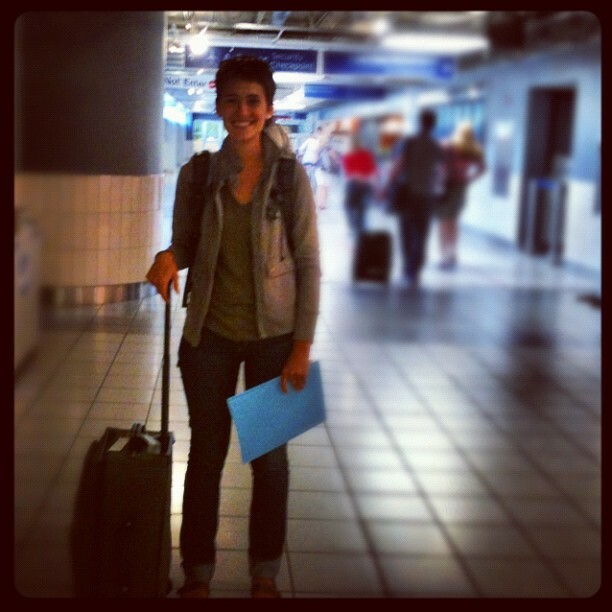 In other Thanksgiving miracles, my friend Jen had to fly to NYC to get a new visa. 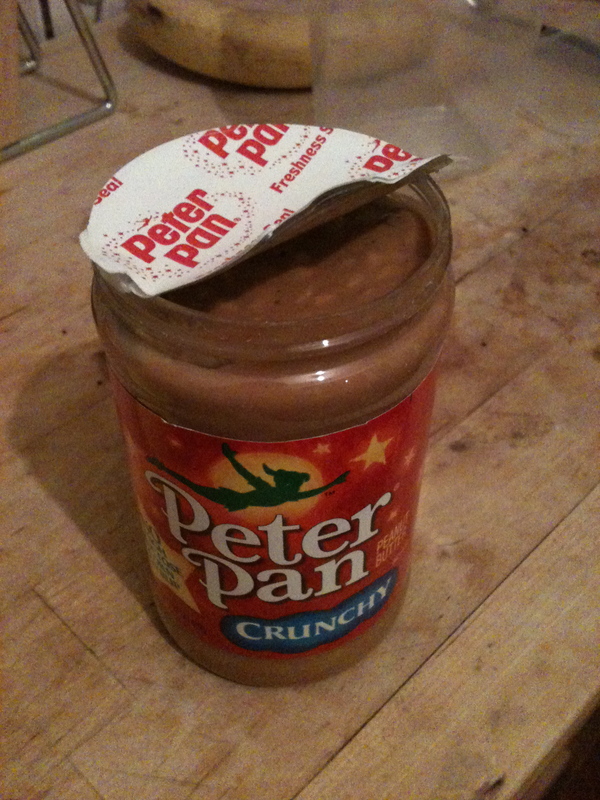 Okay, that’s not a miracle–it was probably frustrating for her–but she brought me back crunchy Peter Pan peanut butter. I love it, I love it, I love it. 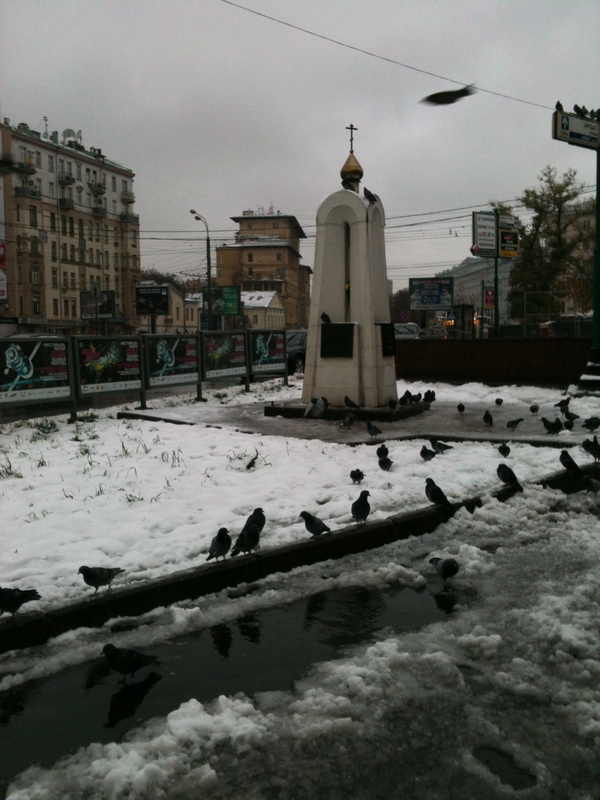 My post last week was right on: it’s fair to say that the Moscow fall I’ve heard so much about is here. 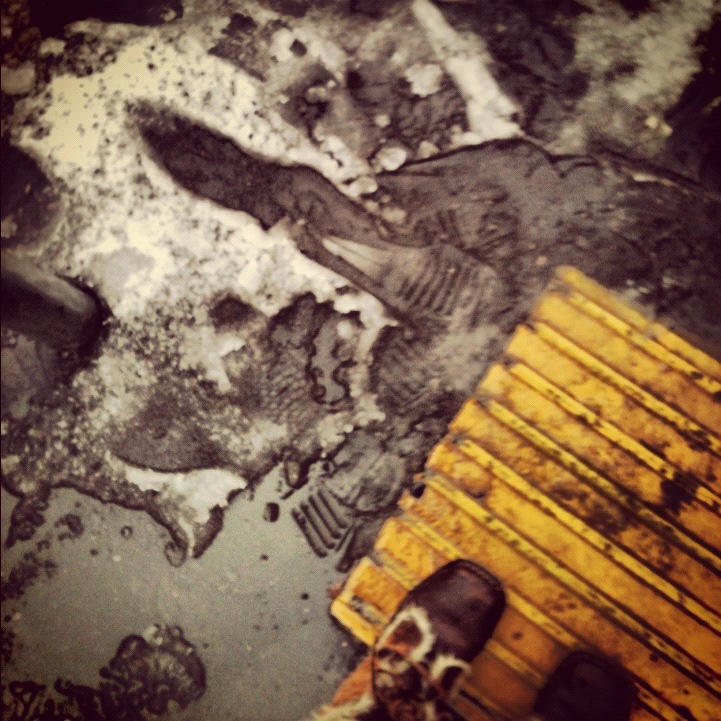 It is rainy and snowy and slushy. It hasn’t stopped all day. The temperatures dropped from the 40s/50s last weekend to the 30s on Monday. We first saw snow on Wednesday, though it only spit. Friday it actually snowed, but by the afternoon everything had melted. We went out that evening and the wind blew and we laughed and walked to the metro heads down, hugging ourselves with our elbows. And here we are on Sunday. 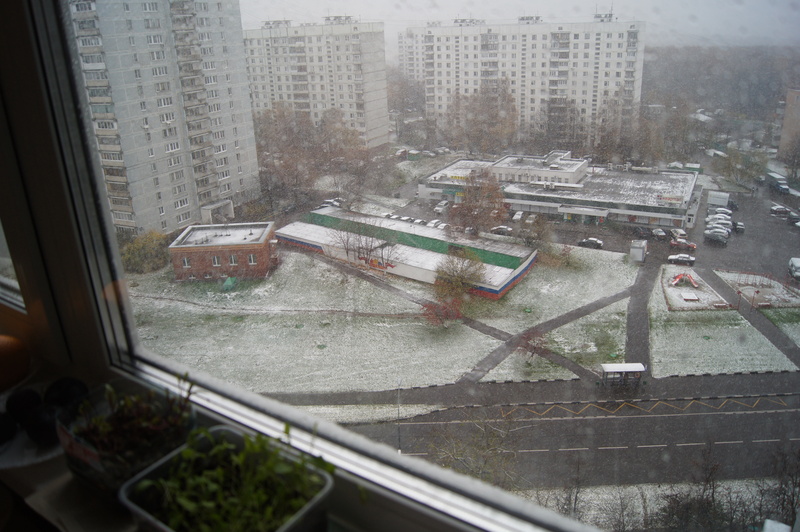 As I was getting home last night from a Russian Halloween party around 1:30 am, it started snowing. It snowed all night and when I woke up this morning, it looked quite pleasant outside. When I opened my window, it didn’t seem that cold and I thought the water drops on the window were just melted snow. So, around 10:30 am, when I decided it was warm enough, I put on my cold weather running gear and my running shoes and headed outside. I smiled at the door woman downstairs. When I opened the door, I realized it was raining. I saw two feral dogs sitting down on the sidewalk. They were completely soaked and their eyes were so sad. I spoke to them: “Oh, feral dogs…I’m so sorry.” I wanted to hug them. But they’re feral, so I didn’t. And then I took off jogging. 1.5 minutes in, I realized that this was a totally stupid idea. Though it wasn’t cold at all, the snow was melting and it was raining and there was nowhere for the water to go so it just puddled everywhere. My shoes were soaked almost instantly. I thought the park might be better, so I turned in there. But it was actually worse. And so I headed back to the apartment. When I entered the building, I got the door lady’s attention, jogged in place, and said “нет.” She laughed. My trip to the Center was much the same. I wore a coat that was too warm, but was waterproof. I took my broken umbrella. I chose the wrong boots; it wasn’t cold enough for my intense winter boots (the ones rated for 30 below), so instead I wore my less intense winter boots, the ones from the Bargain Cave at Cabela’s. Yes, there is something called the Bargain Cave at Cabela’s. About halfway to the metro, I realized that those boots weren’t waterproof. My stuff was all wet on the metro and being so bundled up got uncomfortably warm. I envied the Russians who all seemed to have mastered not being uncomfortable on the metro while being incredibly bundled up, reading their Russian books and watching Madonna and really strange Kylie Minogue videos on their iPads. 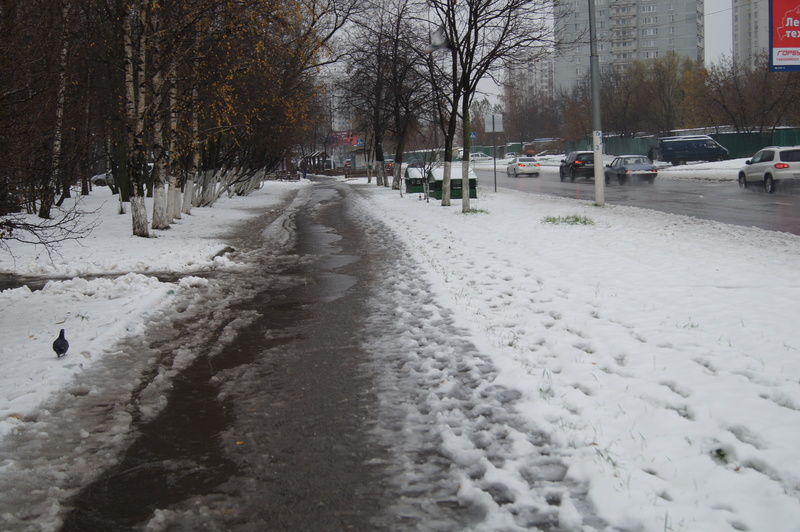 I got off at Arbatskaya, expecting that the sidewalks would be in better condition there. It was, after all, the Center of the city. But they were about the same. And so I made a game of balancing my broken umbrella over my head and jumping over icy puddles and avoiding being hit by cars or splashing water from passing traffic. And then I landed right in the middle of a puddle that was at least five inches deep. And then I cussed for a bit. 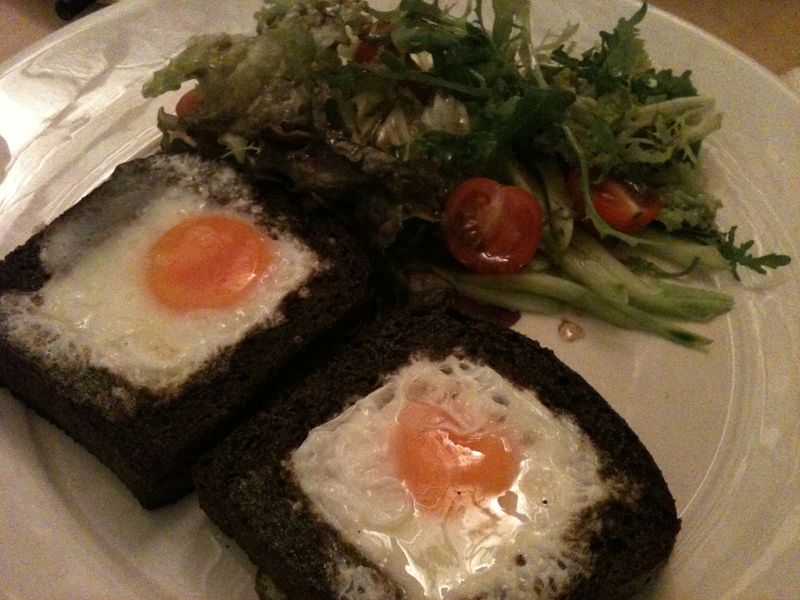 I arrived at my destination–Prostye Veshi–which is currently my favorite Moscow restaurant. And my Midwestern friends Jen and David showed up. Their feet were wet, too. David’s umbrella was also broken. And Jen had also accidentally stepped in an enormous puddle. 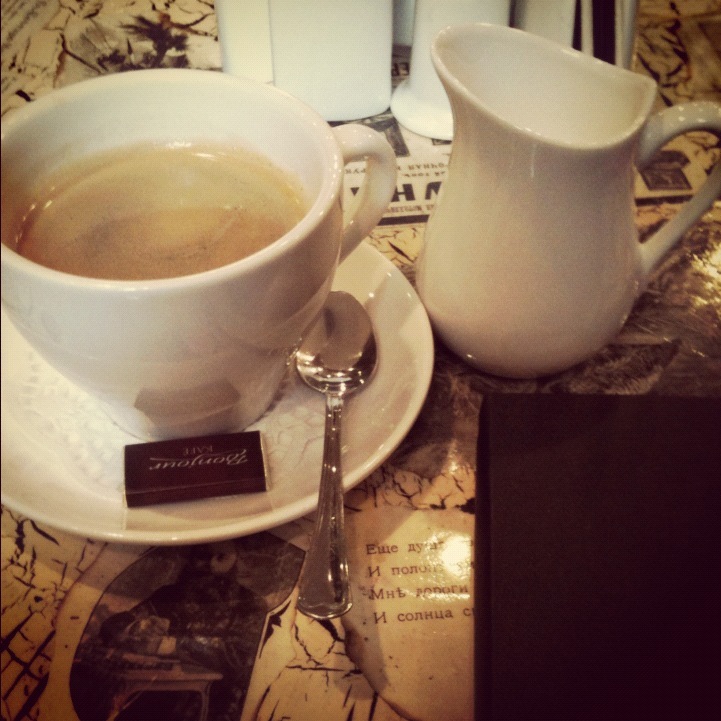 And we had coffee and really lovely breakfast meals. And our waitress spoke a little English and seemed pleased when we spoke Russian. And we sat there for awhile after the meal, talking about accents and the weather and teaching because in Russian restaurants they never rush you or bring you the check until you ask for it. And on the way back, I sang to myself and it seemed like I was much more successful in my game of dodging puddles. A little over three weeks of Moscow life and I’ve started to miss the garden in Lawrence. On days that are cold and rainy, the missing isn’t so bad. 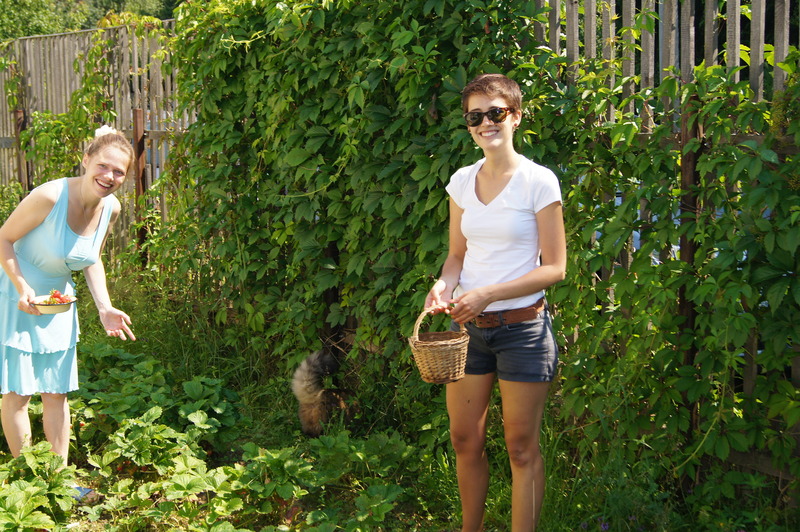 But on sunny days, I wish I could bike to the community garden and weed for a minute. Or just sit. Or see Nic, Michael, or Danielle and talk about which bugs are eating which plants or plan for the fall. Even on the days when I don’t want to actually garden because of the weather, I miss the food. You have no idea how much LCGP swiss chard or kale I could put away if I could somehow access it. Ah, kale…where is the kale in Russia? And the spinach? I’m growing quite fond of cabbage, but cabbage, kale, and spinach are not the same. Luckily there are lots of vegetables here. Really lovely outdoor markets that line the streets by the metro exits. So I normally stock up on fruit and tomatoes and eggplant and peppers there. I just learned, however, that if you’re foreign, you should wash all produce with iodine, which I haven’t been doing. And I eat a lot of vegetables. I learned this fact while I was telling an American friend about a 3-day long (and counting) serious stomach ache. I believe in my body’s ability to adjust to Russia and/or to fight this off, so I’m going to wait it out. [Today I developed cold/flu symptoms. So, I’m drinking ColdRex, which is a brand from New Zealand and I assume is similar to TheraFlu?] Anyway, I’m going to keep eating vegetables. The produce is good and, maybe I’m being optimistic, but I think the eggs here are better, like just the normal ones from the grocery store. The yellows are yellow. Friday night we were out, and I picked up an expat newspaper called element. The writing is so-so, but it’s helpful for giving you an idea of what’s going on in town. And in English, nonetheless. It lists art exhibits and the showtimes for 35 mm, a theater that shows non-Russian films. And there were advertisements for Irish pubs, pizza restaurants, and American looking bars. Daughtry and Nickelback are coming to town, but I’m not going. 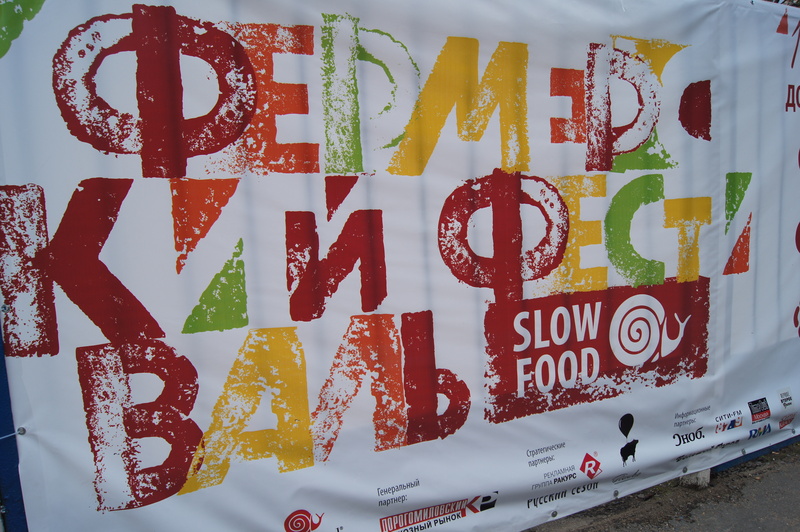 Most importantly, though, I learned that The Slow Food movement would be in Moscow this weekend. 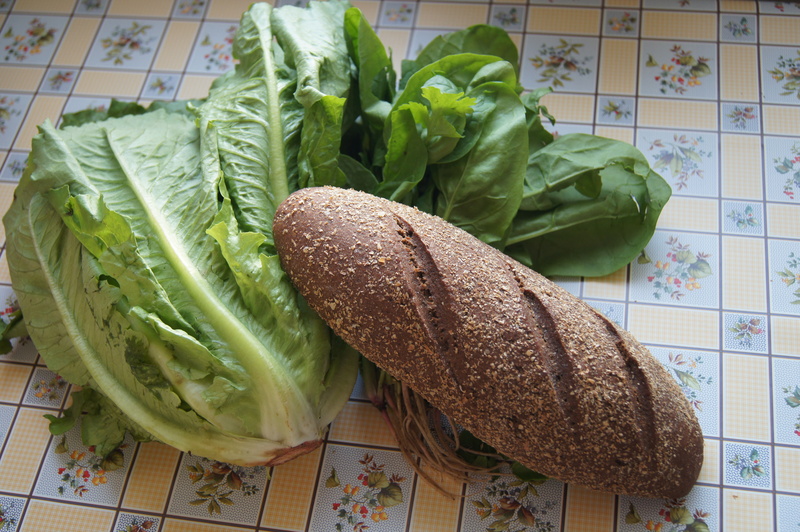 Slow Food, the opposite of Fast Food, encourages people to grow their own food and cook meals that take time. And it was at Dorogomilovsky Market, a place I intended on going anyway. While the street-side markets are pretty and quite convenient, I want something bigger, like a Farmer’s Market. And I wanted to see people who like real food. So, Sunday afternoon, I went. Unfortunately, aside from a few signs, I didn’t see much that seemed related to the festival. Maybe people there were talking about slow food, and it was just lost on me because it was in Russian. 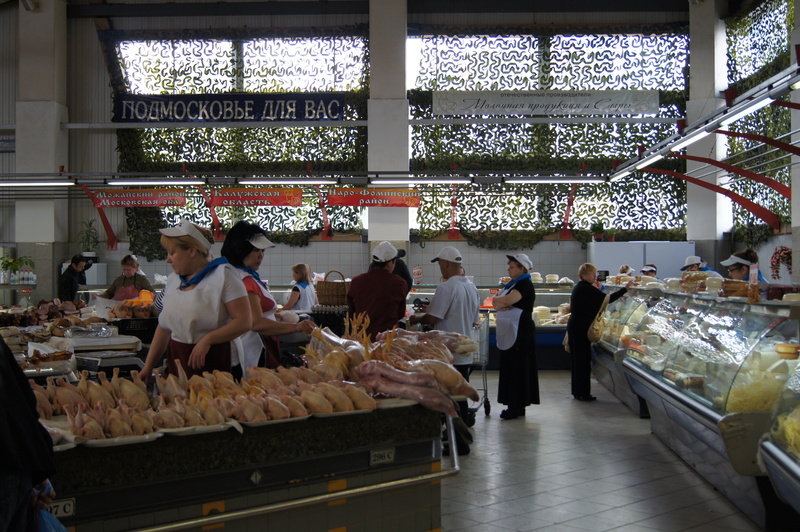 Instead, it seemed like what I would expect a normal Sunday at Dorogomilovsky Market to be. Despite not meeting my festival expectations, I still got to see and buy real food. I began my “buying things in Russia” cycle. First, I wander around, slowly reading Russian signs to get a sense of what’s there and how much it costs. I saw fruit and vegetable stands that all seemed exactly the same. Then there was what I labeled the “pickled stuff” section. Then the dairy section. And then fish. And then I got to the section with enormous slabs of meat and entire chickens. And also rabbits; I’m 99% sure judging by the furry feet. The second stage of the “buying things in Russia” cycle is when I freak out (internally, of course) and decide that I just won’t buy anything. 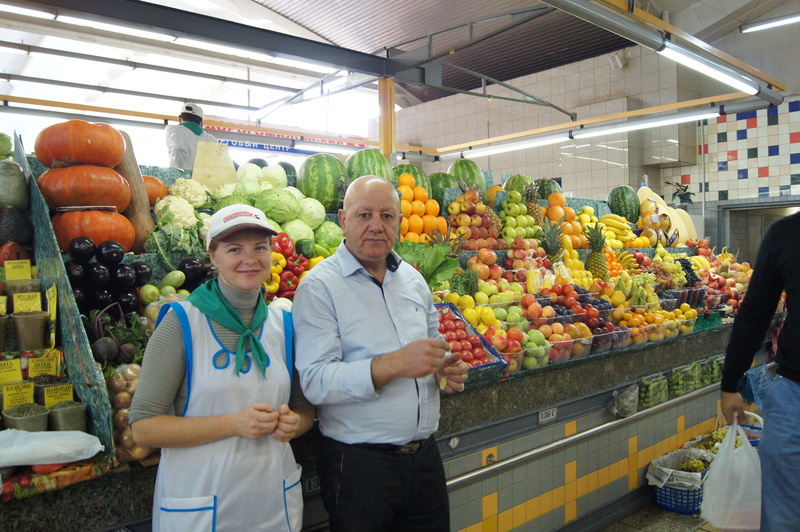 The vendors here talk to you if you glance their direction, trying to get you to choose their stand, so looking at the produce without being noticed was impossible and examining something meant I’d have to speak in Russian or nod a lot. But then, I played the current scenario in my head–I ride the metro for 30 minutes, walk for 15 to the market, and then leave without purchasing a thing–and that just seemed stupid. So I moved to the third stage, which is when I find a secluded corner and look up words and phrases in my travel book. After I’ve practiced the phrases to myself, I use my fingers to save those pages and then I approach someone who looks nice. The bread ladies seemed nice; they weren’t. But, I asked “сколько они стоят?” and bought bread. And then, I went to the rows of vegetable pyramids. And a vendor motioned to my camera, indicating that I should take a photo. So I did. He also gave me a grape. He owned one of the few stand with lettuce that didn’t look like it was from the supermarket, so again I asked “сколько они стоят?” and the woman said “сто,” which I thought meant “100,” but I wasn’t sure so I typed it into my iPhone’s calculator and she said “да,” so I bought i t.
By this point, I was feeling quite brave so when I found a stand with spinach (yes….spinach! ), I walked right up and said “шпинат?” because that was one of the first words I learned and then “сколько они стоят?” The man said “пятьдесят,” and I double checked again on my iPhone and I was right, it was 50. I bought one bunch, and he asked if I was German. I walked around a bit more and then realized that since this was the first spinach I’d seen, I should stock up. So, without being embarrassed, I went back and bought a second bunch. 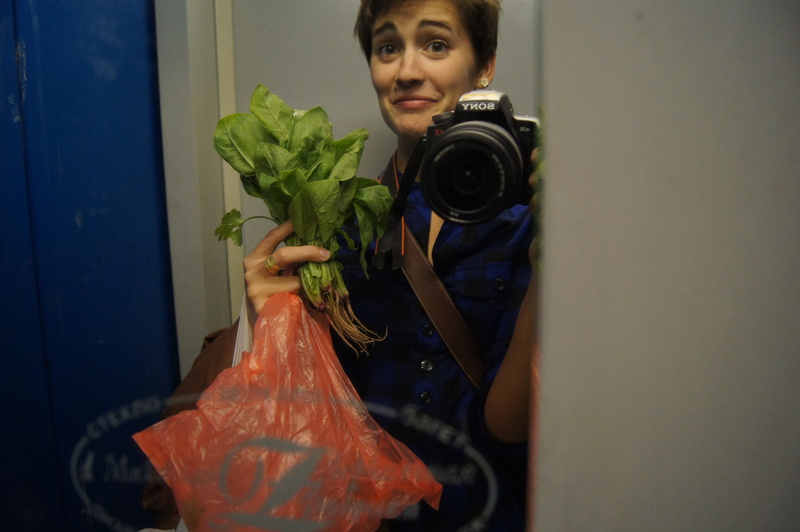 And I was so happy about the spinach that when I had coffee with a friend afterward, I asked her to take a photo of me with it; but frankly, I’m becoming quite fond of the Ride to the Fifteenth Floor Elevator Self Portrait. Expect more. 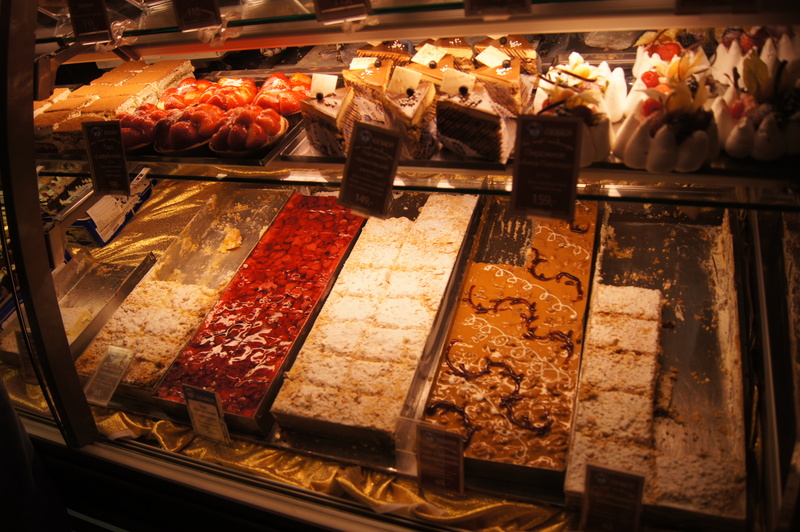 There was a cart of small desserts I’d been eying since I walked into the market. They seemed free, like part of the festival or something. I had walked past the cart three times trying to decide if they were or not. I saw a group of men hovering around them and eating them, so on my way out I grabbed one of the bigger pieces of baklava. Then I heard a woman say something loudly. She was probably talking to someone else, seeing as how the market was loud and many people were yelling and how there was clearly no cash register or stand connected to this cart. But, the thought of being caught stealing in Russia alarmed me. So I exited quickly and purposefully and inhaled the evidence. IKEA Can Sell You Things for Your One-Bedroom Apartment. Sunda y I secured my spot in the group of 20-and-30-something-year-old wannabe/amateur interior designers who dream of the home office that fits their aesthetic and the kitchen that makes up for its lack of counter space by employing shiny hooks and shelves that hang from the walls. 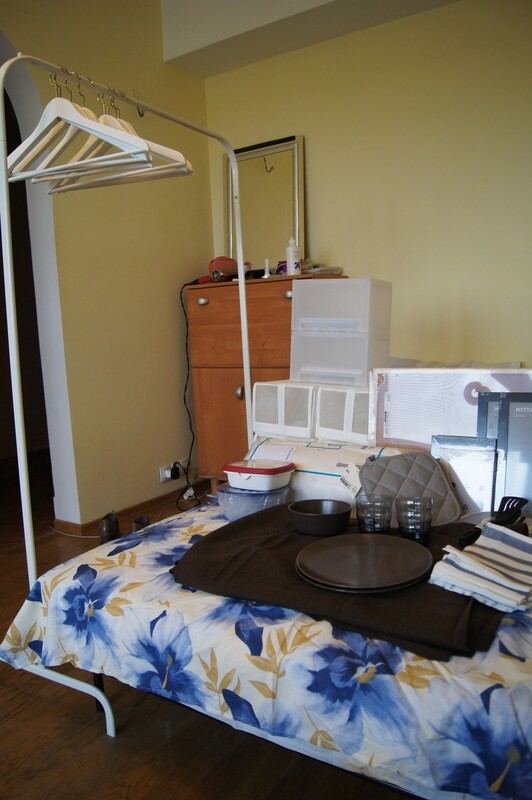 I’ve finally been to IKEA, though I went all the way to Moscow to do it. My brain is inundated with images of innovative bookshelves, lavender coffee tables, and slender filing cabinets. I don’t know what my perfect bedroom looks like yet, but you can be certain that I’m brainstorming, drawing floor plans, subscribing to the IKEA catalogue. I wandered the display rooms, pictured myself drinking cups of tea on various couches and baking cookies and homemade bread in all the kitchens. I envied Zooey Deschanel for going there with Joseph Gordon-Levitt, the way they tested beds and stoves, and plotted their theoretical home. Since getting to Russia, I’ve been pretty darn resourceful. In my temporary apartment, I made it a goal to buy as few things as possible, because I didn’t want to move them to a new place. So, I bought foods that could be eaten for every meal—rice, bread, fruit, eggs, cheese—and when home, I ate basically only those things. I saved plastic bags, which are surprisingly useful for keeping your passport/visa sweat-proof and rain-proof in your sports bra when you’re out for a morning jog. Though it’s only been a few days, I love my new place. It is sunny sunny sunny. 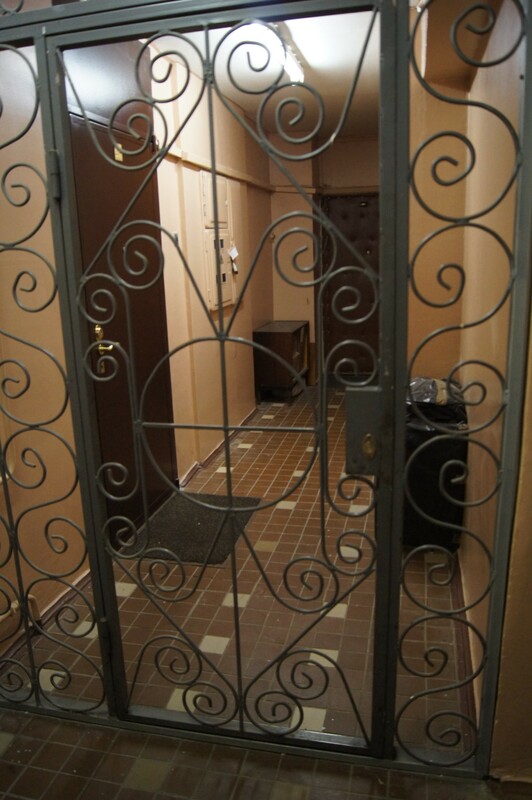 The doorways inside the apartment have arches (which almost everyone comments on). It’s only four metro stops from work. 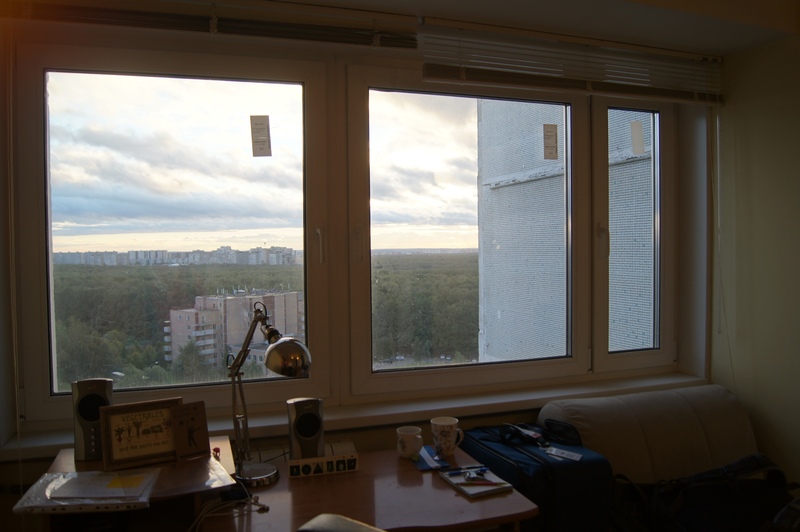 I live on the fifteenth floor, which is awesome, and like all Russian apartments I’ve seen, there are three levels of security—a magnet-key gets me in the front door, a gate gets me into my side of the fifteenth floor, and then I unlock my door. No one can get to me. There is a huge, beautiful park (photos to come) across the street and I can see it out of my window. But since I’m still settling in here, I’ve still had to be resourceful. 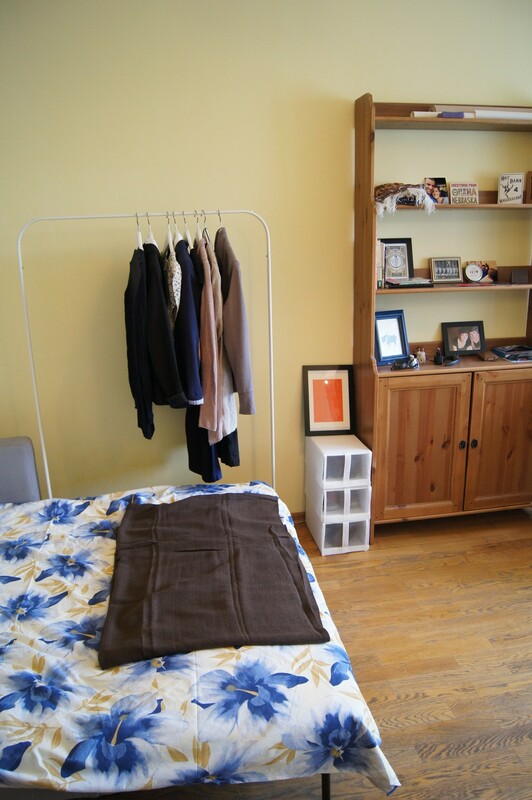 While I had furniture, sheets, and a few kitchen items the first few days, I didn’t have many basics. Example: On my first night here, I didn’t get home from work until 8:45 because I had to stop at this quasi-mall to buy a towel for showering and then go to the grocery store. 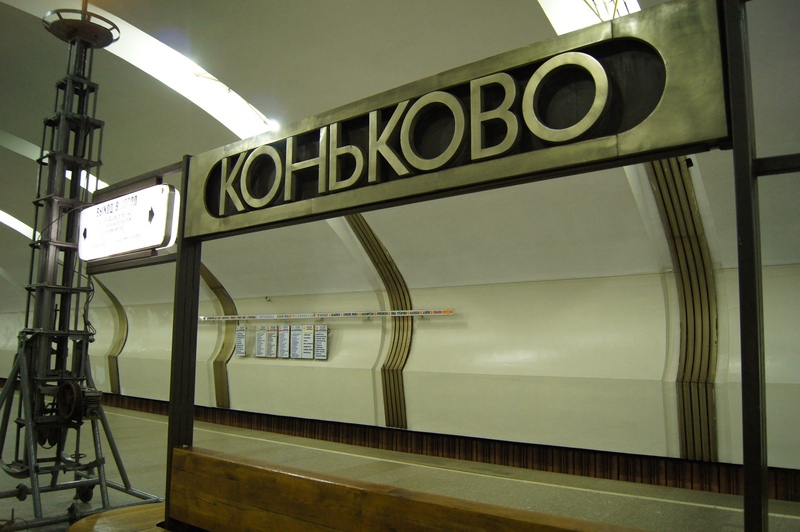 After getting yelled at by the Russian cashier for not knowing the word she used for “bag” (it was different than the one I knew), I rode the metro to my stop. I bought eggs for dinner, but once home, I realized I didn’t have a skillet. I did, however, have a pot. So, I had salad with hardboiled eggs. Maybe that’s not a big deal, but at the end of a day where I moved into my new apartment, went to work, negotiated with the towel lady using only hand gestures and “yes” and “no” in Russian, got yelled at by a Russian cashier, and realized that I didn’t have the main cooking instrument I had planned on using for the dinner I was hungry for, it felt pretty damn resourceful to make a legitimate meal and not just eat chocolate and crackers (I’ve found some REAL tasty Russian crackers) for dinner. The next day, I bought fruits and vegetables from one of the many outdoor vendors and made essentially the same meal. And it was great. 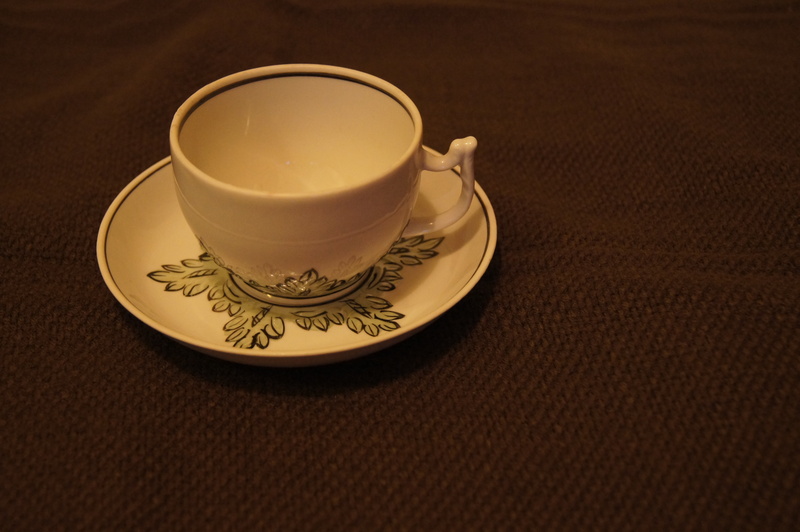 One new friend from work gave me extra dishes from her apartment—a few bowls, some mugs, and a lovely Russian tea set. And that was just really nice and it definitely made it easier for me to eat meals here. I like being resourceful, but I also like hanging up my blazers and frying eggs in a skillet, so two of my friends took me to IKEA. There I was daydreaming. And then, like I assume happens to many 20-and-30-something-year-old wannabe/amateur designers in complete awe of IKEA, I remembered that I am a 20-something-year-old. And that I am renting an expensive, tiny one-bedroom apartment in Moscow, Russia. And I remembered that the 56cm x 70cm x 19cm space in my bathroom would certainly not hold the iron shelf I liked so much. And I realized that in order to implement all the design ideas I had rolling around in my head, I would surely need a mansion. And that anything I buy here—even if it is a dark red nightstand I love dearly—will likely stay in Russia when I go back to the States . So I got real. I still oooh-ed and aaah-ed at every perfect display room. And I wondered how awesome it must be to be an 8-year-old with a tree house for a bedroom. But I made sure everything I bought had a purpose. And I used the paper ruler they provided and I measured things. And I paid attention to price tags and got out my phone to divide the ruble amounts by 32 to see about how much it was in dollars. A new friend here claimed that it was impossible for a trip to IKEA to take less than two hours; he suspects this is the reason IKEA has a cafeteria. I nodded politely, as Midwesterners do, and thought “He hasn’t seen me shop.” I hate shopping and so I shop quickly. My ideal shopping day is going to the Gap with Katie W or Clare E, buying the one item I need, and then getting out of there. Thirty minutes tops. So, I thought I could do IKEA quickly, not thirty minutes quick, but quick. How wrong I was; we were there for at least 2.5 hours, and I think I enjoyed every minute of it. When I saw that I spent 6,173 rubles, I sort of freaked out. But then I realized that was only about $200 and for everything I got, it seemed pretty good. I bought picture frames and a bulletin board. And two plates, one bowl, and two glasses. I got Tupperware, three small cooking utensils, two skillets, pot holders and some kitchen towels. And I needed something for the bathroom so I found these plastic drawers and bought these little boxes in which two pairs of shoes fit perfectly. I bought wooden hangers. And I assembled a metal closet/rack thing in a dress, using a knife with some remnants of a hardboiled egg as a screwdriver. Can someone please send me a screwdriver? P reface: I write you from a coffee shop near my temporary apartment (please note that I successfully ordered myself an Americano in a broken, but complete, Russian sentence). There is a child here with his really beautiful Russian mom. And in between playing with the napkins and sugar cubes, eating some kind of pastry I wish my mom would buy for me, and dancing to “Moves like Jagger” by Maroon Five in his chair, he keeps staring at me. Over and over again. I don’t know why. I’m on my MacBook Pro writing. I’ve showered, though I am sorta dressed like a lumberjack. I’ve looked WAY weirder than this in Lawrence and gotten no looks at all. When children stare at me, I feel weird and wonder why I am worth staring at. But he’s the one touching all the sugar cubes, so maybe he’s the weird one. 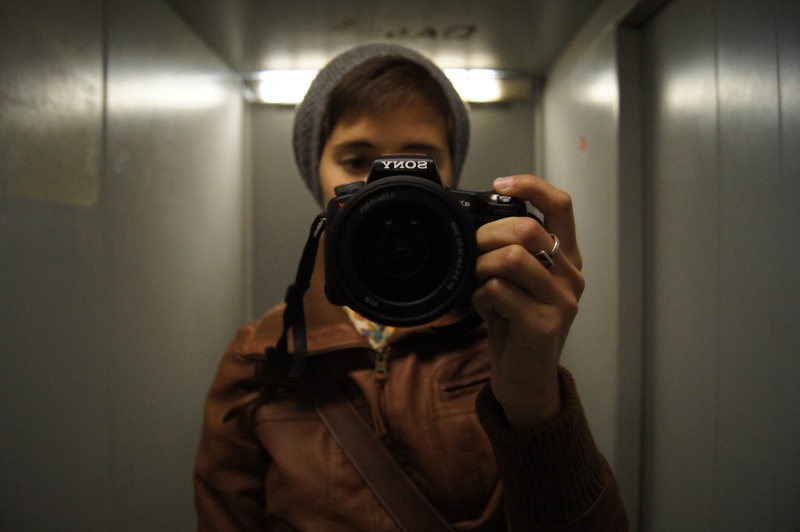 But I digress: A major part of my first week of Moscow life was going to my job. I arrived in Moscow Friday morning (8/24) and started work on Monday (8/27). At first I was worried that starting work so soon was a bad idea, but in hindsight it seems perfect. Going to work and having a purpose and meeting a lot of people was just what I needed to help myself feel more settled here. When I chose Rhetoric and Composition for my Master’s, my goal was to focus on writing center work and eventually get an administrative job in a writing center, ideally as an Assistant Director so I’d have some practice working with someone before I went for a big, ol Director position. I maintained my interest in writing centers throughout graduate school and so as graduation approached, I applied primarily for writing center jobs. This job at the New Economic School in Moscow was listed, so I thought about it for a few days and then applied. Because I have zero Russian experience and zero economics/business experience, I didn’t expect to even get an interview for this job. But then when I did, I was really excited. And when the job was offered to me—the exact position I’d hoped for paired with a major adventure—I couldn’t imagine not taking it. These things are also worth noting: 1) NES is one of the best economic schools in Russia. 2) This is the first writing center in Russia. The first writing center in Russia. My boss Olga started the Writing and Communication Center on her own last year and realized she needed an assistant. So, I’m coming in at a great time for growth/development/professional experience 3) The discipline Rhetoric and Composition (my field) doesn’t really exist in Russia. We are bringing new teaching practices/theories here. So, I’m really getting to do something quite unique. So here I am. As the Assistant Director of the Writing and Communication Center at NES, I’ll have a number of roles. Right now, my goals and responsibilities are as follows: 1) I will work with students one-on-one—on academic writing, professional writing, personal writing, maybe even creative writing. I will help plan and lead workshops for students. I will work with English faculty, helping them design their courses/syllabi/writing assignments. Obviously my goals and responsibilities will change/develop as the academic year progresses, but for now, these are the most pressing issues at NES. Eventually, I may teach a course but for my first year, I will only do writing center stuff. It’s also worth noting that this is my first ever real, adult job. Obviously, teaching for three years in graduate school was a real job; however, grad school is in between being a grown up/having a job-job and being a student. So, then it was appropriate for me to wear flannel and/or Keds to work and also to fill my backpack with leftover food from department events. Oddly enough, when I was preparing and being super anxious/excited/nervous, I thought very little about the fact that I was making a transition into a job-job. 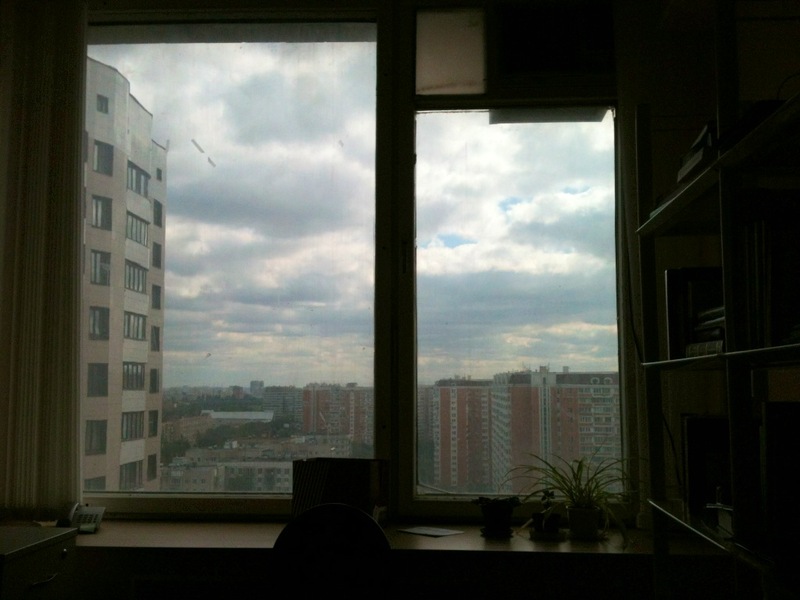 I think that’s because I assumed the job in a writing center/academia, would be the most normal/comfortable part of my Russian life. And after a week at work, I think it definitely is. I mean, there are lots of differences between this school and KU, I’m still meeting people, and I’m definitely still figuring out my place/role at NES, but from this first week, I think I am going to love this job and the people here. Much of the week was spent doing paperwork and getting an email account and having long lunches and being shuttled around the school meeting people. But, I’ve had little moments of a “normal” day and those moments feel really good. I also kind of like wearing work clothes; I think it makes me seem important on the Metro. Side note: That’s how ugly my temporary apartment is. We’ll talk more about Russian decor later. 1) Brainstorming with Olga, an English teacher, and the website content manager (who is also a painter) about how we should decorate the WCC. 2) I’m embarrassed to admit this, but…the cafeteria (“canteen” here). It’s just that–a cafeteria–where you walk through with a tray and ask for food. Very orderly, very Soviet. The food is actually quite good and it’s allowing me to try things inexpensively. Every day here’s what happens: Olga reads the menu to me in English. Regardless of what the entrees are, I have pretty much the same thing. Some kind of cabbage/beet/or greek salad. And soup because I’m usually cold. And, then, even though I say I won’t, I always have a pirozhki. If I get fat from Russian food, these guys will be to blame. The first time I ordered this “small” lunch (a Russian lunch would be these things plus an entree), the women who work in the cafeteria were surprised and asked in Russian “Is that all?” but now they understand my system. They smile when I come through the aisle, and on Thursday, when I asked for borscht for a second day in a row and they had run out, they told Olga that they wanted me to try another one instead. Then, the women at the cash register told Olga that she liked it that I ate pirozhki every day. 3) Having two lovely evenings out in Moscow with colleagues at two ultra hip restaurants. (I’m easing my way into nightlife here). 4) There are free cookies and tea every single day at work. Cookies. Every. Single. Day. 5) Attending two orientations for students—one for the MA program and one for the BA program. It was actually quite funny…Olga would talk somewhere between 5 and 7 minutes in Russian about the WCC and the services we offer students. And then I’d hear “Kara Bollinger” and I’d take the microphone and talk for about 45 seconds. I spoke my English slowly so they’d understand. I introduced myself. And said my Russian was bad and then laughed. And explained to them why I was at NES. And told them that I was really excited to work with them at the WCC. And both times, the students leaned forward. And laughed when I laughed. And nodded at me encouragingly. And smiled real big. I am alive and well in Moscow, attempting to become a Muscovite or an expatriate or something. Maybe I’m partially both of those. Maybe I’m still just surviving. 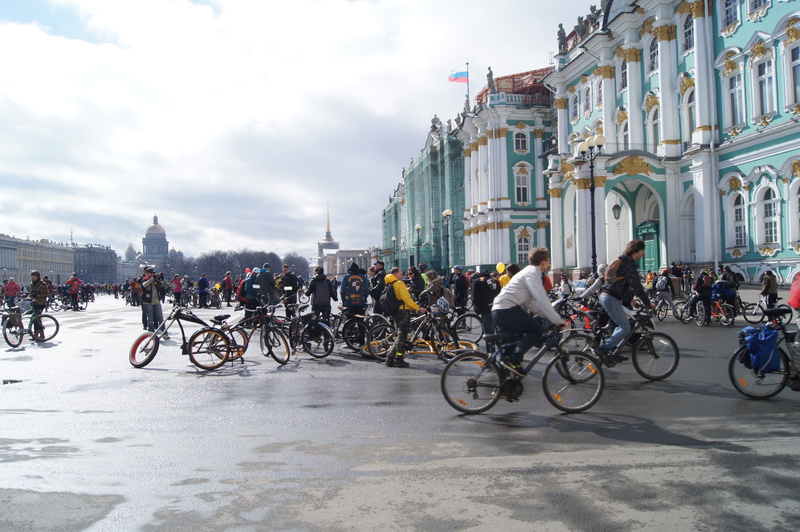 I realize I could/should start a new “Moscow” blog, but I’m quite fond of this one. 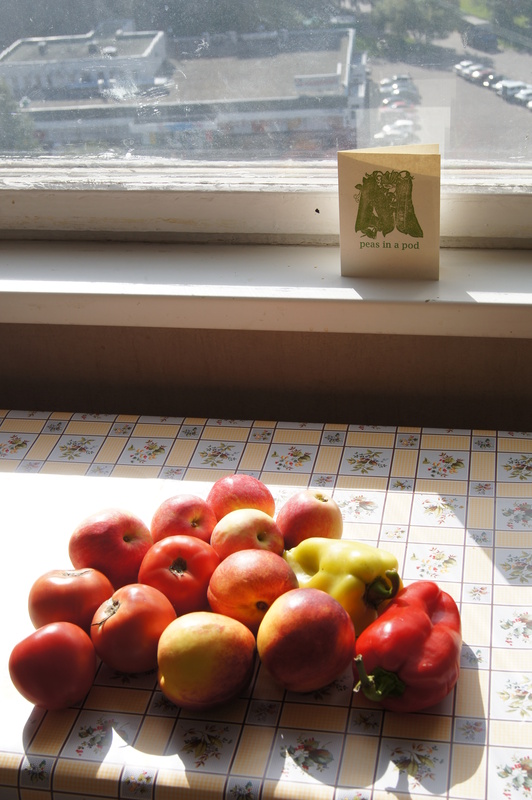 I don’t expect to find much gardening in like, the coldest place on earth, but if I do, you know I will write about it. 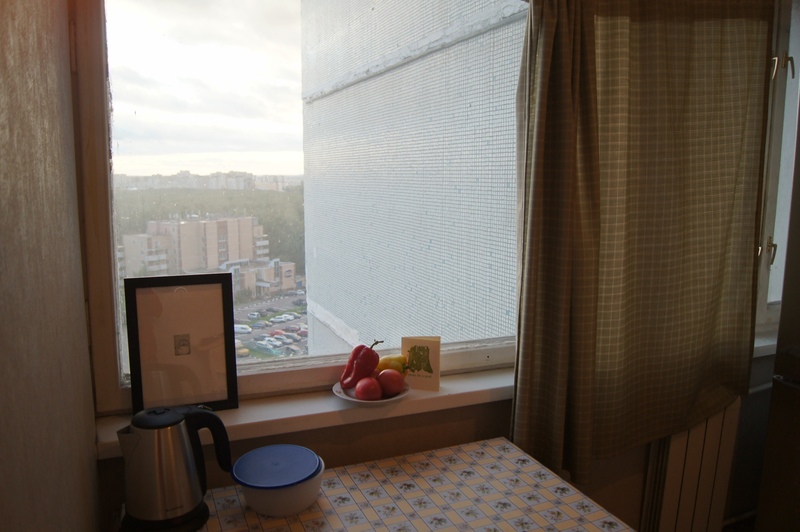 So, here’s where we are with Moscow life: I’ve been here one week exactly. I’ve had a full week of work. I’ve done a bit of sight-seeing. I’ve heard a whole hell of a lot of a language I don’t understand. I’ve learned to say “Спасибо” real well. So much has already happened and my head is kind of all over the place, so there is a lot I could write about. But, I decided that in honor of my first full week, I should write about my first day. And to focus on food because the only thing that really happened to me that day involved food. And it sort of serves as a transition from gardening. And it’s a basic human need, which is kind of what you focus on when moving halfway around the world. And it’s where I had my first mini “I just moved to Russia” breakdown. Soul baring, here we go. I arrived super jet-lagged. When you are in the air leaving JFK on your way to Russia, you sort of spend the whole trip wondering what you’re doing with your life. So after riding in a taxi with a driver who only spoke Russian and then trying to get my apartment keys from a girl who didn’t speak English, I took a short nap. My body/brain were kind of off but I imagine that by this point, it was somewhere around 6:30. So, I ventured out to find food since I hadn’t eaten much except airplane food. Despite what people had told me, very few things are in English here and very few people speak English. None of the restaurants near my apartment had English menus–and I wasn’t desperate enough for McDonalds–so I decided to cook for myself. The market near my house is small, offering mostly necessities. 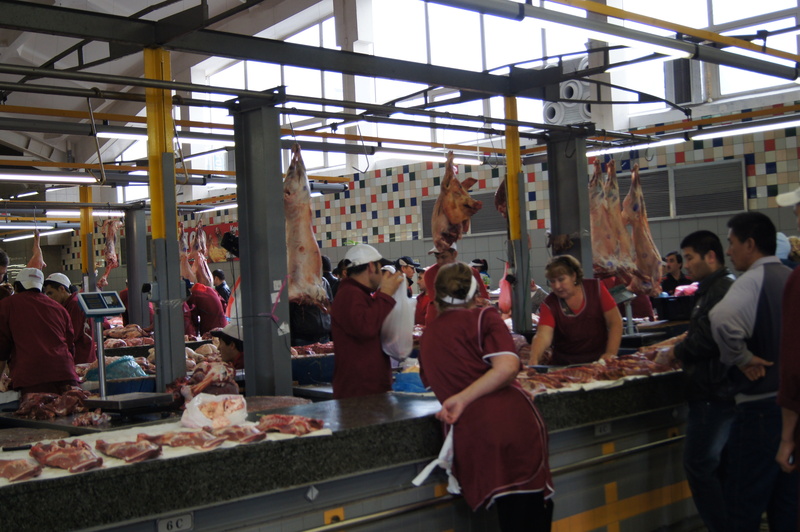 At this market, everything is behind the counter. So, rather than collecting items myself and then paying for them, I have to ask for each item. The first time I walked into the market, I hovered for about 47 seconds and walked right back out, too intimidated to ask for anything. I had already upset the cashier at the pharmacy by trying to speak English, so I knew I had to try Russian. I didn’t want to make the same mistake with the market ladies. 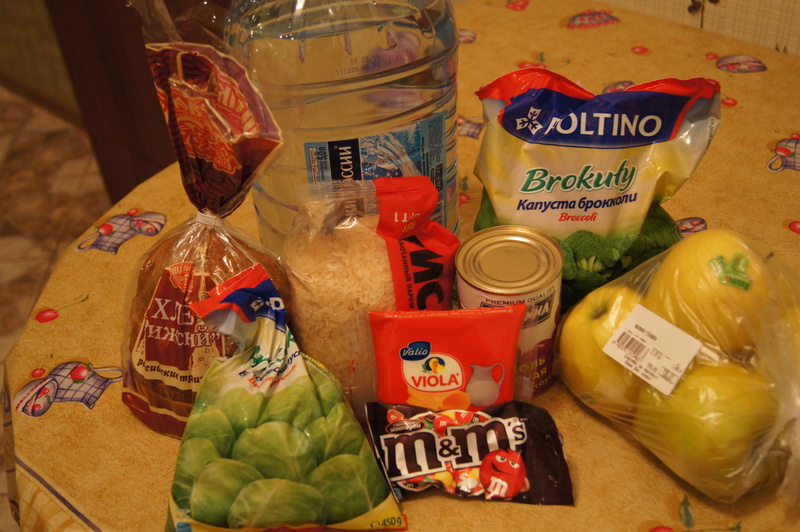 I walked in a second time and asked for rice, beans, frozen broccoli, and frozen brussel sprouts in Russian. And when I say “in Russian,” I mean that I said single words (not sentences) and pointed: “Рис,” “Консервированной фасоли,”etc. And she said “Oh, wow.” And then I slowly counted out the wrong number of rubles and she said “Нет, Нет, Нет” and shook her head, giving me back the extra bills. I filled the pots from my apartment with water. And I felt really grown up and well adjusted for cooking myself a meal on my first night in Russia. But then I realized I couldn’t cook the food because the stove wouldn’t light. I thought I might need a match but I wasn’t sure and I was afraid of blowing myself up. And I didn’t have any matches anyway. So I did what anyone would do: I cried to my sister on Skype. And I said I was a failure. And that I was tired. And that the lady at the pharmacy was mean to me. And I asked what was I even doing in Russian anyway since I couldn’t speak the language. And I said was really hungry and I’d bought all this food that I couldn’t eat. And I also said I couldn’t even drink the water because the tap water is dangerous and has to be boiled first and my stove didn’t work. So we devised a plan where I would go back to the market for a third time and at least buy bread, cheese, apples and water. I went back and I used my travel book to ask for those things. I bought the cheese in the red package because I knew how to say “red,” the loaf of bread in the red plastic, too. I also bought M&Ms. The ladies smiled at me. When I said I wanted water, they asked what size and I motioned “big” with my hands. But they wouldn’t let that slide. Instead, they said “пять.” And they made me repeat the word until I said it correctly. And that’s when I realized they liked me, that they wanted to help me learned. So I tried really hard to say”пять” well. I went to that market every day for the first four days, adding a new word or two each time I went. When I got home, I had a piece of bread and some cheese and an apple. Despite feeling accomplished for being brave at the market, I didn’t feel that great. I cried some. And looked at photos of my friends. And sent emails. And then I slept 13 hours. I met up with a new American friend from work. We went to a Ukranian restaurant and I had my first real Slavic meal. And he warned me that it would be heavy. We ordered pickled herring and dumplings filled with potatoes and mushrooms. It was delicious and I ate all of it. This feels like a weird way to start the blog. Like instead, I should tell you that Russia is so great and that I saw Red Square (which I did), bought a babushka shawl (which I also did), ate piroshki (which I do every day) and that I feel really awesome. I mean, that’s the persona we all like to create. But the first day wasn’t great. It was overwhelming in a number of ways. I think this experience will be overwhelmingly good and overwhelmingly difficult and overwhelmingly funny and weird. The good parts are really great, and I dread the difficult parts. So when I write about the difficult parts, please don’t worry about me or emergency call me at $4.99 a minute. It’ll get better. It’s rained almost half the time I’ve been here. And the days that are considered “sunny” here would be called “overcast” in Kansas. But there are pockets of light. I blog mostly about gardening, but also about travel, teaching, writing, and adventures in my new home, KCMO. kc garden: when you ask for a garden plot and get an entire field. If you click here, you can get email updates when I update the blog.